Provided 208 to Gangavaram Fishermen, and balance 92 would be provided on the vacation of stay order of Hon'ble SC . However, the amount towards monthly wages for balance 92 numbers is being deposited with the District Collector, Vizag. Gangavaram Port is the only sea port in India that had provided employment to the Project Affected families in the first year of operation. 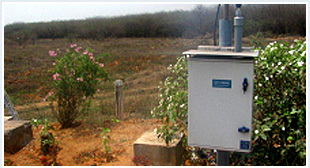 Ministry of Environment & Forest (MoEF ) approved our Environment Monitoring Programme which aims at controlling pollution at the source level to the possible extent with the latest available technology followed by continuous and periodical monitoring of environmental attributes in the region which include monitoring of air quality, water quality (Ground water & marine waters), sediment and ecology . Three numbers Continuous of Ambient Air Quality monitoring machines established in and around the port premises to continuous monitoring air quality and also, if needed, to initiate required pollution control measures to maintain air quality with in the norms set by APPCB and also to achieve the environment sustainability. As per the statutory regulations, Ground water quality monitoring is being carried out on monthly basis in the Port premises locations as well as neighboring village Gangavaram. The marine water and sediment quality monitoring is being carried out on monthly basis of tidal sampling for the two locations at inner and outer harbour. Physical, chemical and biological parameters were analyzed for marine waters as well as for marine sediment to assess the water quality. With an aim to achieve environment sustainability as laid down in Environment Monitoring Programme , Gangavaram Port initiated the measures as here under. Gangavaram Port is the most environmental friendly port with the most modern infrastructure facilities for cargo handling and equipped with modern systems for pollution control measures with mechanized cargo handling equipment, including Ship Loader for bulk exports, Ship Un-loaders for bulk imports, Mobile Harbour Cranes for bulk/break bulk cargo, associated conveyer systems for transportation to and from stack yard, Stackers & Re-claimers for stack yard operations and Wagon loader & Wagon tipplers for handling Railway rakes. The fugitive dust generated during the operations of different commodities is controlled by Mechanical Dust Suppression Systems. 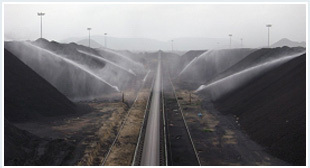 Established state of art modern mechanical conveyor system for handling coal & Iron ore to prevent the spillage of cargo and provided closed enclosures for the entire conveyor system to curb fugitive emissions of coal/iron ore particles in to the air. Asphalted the road within the port premises and a dedicated sweeping machine is being used for the cleaning of berths, back up areas and roads. Water sprinkling is being carried out at the berths and in other areas viz. Roads and yards through water tankers to arrest the dust pollution due to the vehicular movement in the port. 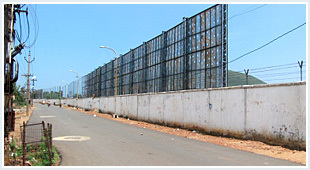 GPL created a wind breaking wall near Gangavaram village to prevent any dust trickling in to the nearby habitation. Zero wastewater discharge concept is being implemented in the port. The Stack yards and terminals are designed sloping landward for collection of the runoffs into the Sewage collection network. The residual water generated due to the sprinkling activities on the cargoes will be collected into the Effluent Settling Pond through liquid waste network. Pollution control facilities are designed with a possibility of recycling the wastes, Two (15 KLD & 5 KLD) sewage treatment plants are exist in port facilities and the treated water is used for green belt and dust suppression only. Appropriate rain water harvesting systems are established throughout the port. 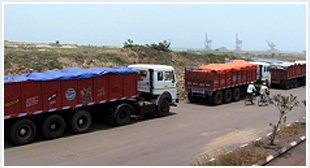 Suitable solid waste management plan is being followed in the port. All the bio degradable waste is being used as manure for the plantation. 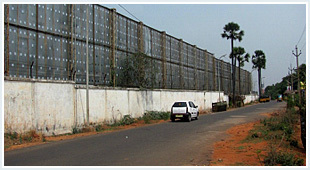 The reports of Environment Monitoring Programme are furnished to MoEF and AP Pollution Control Board regularly. In addition to our monitoring programme, AP Pollution Control Board also monitors pollution parameters. All the above parameters are well with in the norms set by enforcing authorities i.e. MoEF and AP Pollution Control Board. 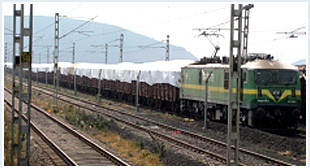 Ministry of Environment and Forests (MoEF), Govt of India has accorded Environmental Clearances (EC) for the port facilities 1) No.10-3/2005-IA-III Dated 11/03/2005, 2) N0.10-14/2009-IA-III Dated 19/03/2010, 3) 11-91/2010-IA-III dated 7/02/2012. Environment management Plan (EMP) approved by the Ministry of Environment and Forests (MoEF), Govt of India is being implemented in the port to achieve the environmental sustainability. Andhra Pradesh Pollution Control Board, Govt of Andhra Pradesh has accorded Consent for Establishment (CFE) and Consent for Operations (CFO). The monitoring reports are being furnished to the MoEF and APPCB as per the statutory regulations. 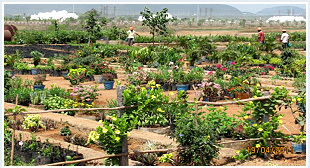 GPL is participating in "Green Plantation Programme " proposed by the Parliament Committee for planting 40 lakh plants in the next 5 years in the Visakhapatnam city. GPL has committed to the authorities to plant one lakh saplings out side the port area in the next 5 years . 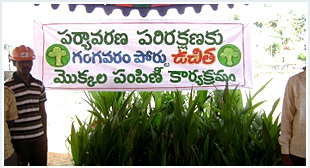 GPL on 6th August 2012 inaugurated a massive drive of planting 20,000 saplings near Yarada Hills as a part of the ‘Green Visakha’ project. MLA of Gajuwaka Sri. 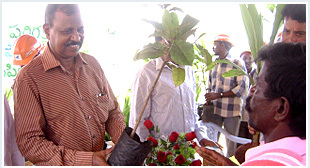 Ch Venkata Ramayya and other officials were present in the plantation drive. 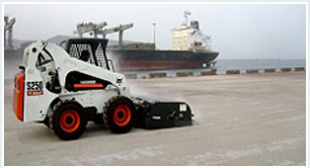 Frequent watering of the berths and back up areas is established with sufficient water tankers and the sweeping machine sweeps the Berths and Roads frequently. Around 1.50 lakh saplings were planted in an area of 270 acres of land as a part of Green Belt scheme and an exclusive nursery has been established for the said purpose. GPL has provided various facilities to the schools in the neighboring villages. The facilities include construction of toilets, for boys and girls, digging of bore well, motor pumps for supply of water, furniture for students and teachers etc. Sports kits were given to promote sportsmanship and physical activity among children. 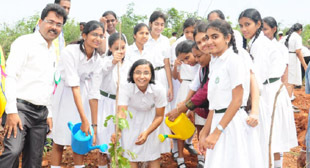 These facilities were created for healthy environment for the students. Gangavaram school was provided with furniture and other amenities to improve sanitation and conditions in the school of Gangavaram. Infrastructure facilities were provided and school bags were distributed to school on 21.09.2014. Infrastructure facilities were provided and school bags were distributed to school at village on 17.08.2015. Infrastructure facilities were provided and school bags were distributed to school on 06.12.2016. Infrastructure facilities were provided and school bags were distributed to school at village on 23.08.2016. Drinking Water Supply to nearby villages under CSR program. 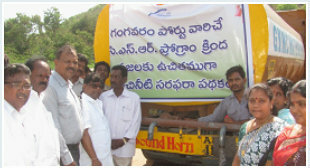 GPL Provided 10 Tankers each 12 KL Drinking water to nearby villages (Gangavaram and Dibbapalem). Woman Empowerment - Sewing Training Program to women.